By now, the name Transform or its earlier variant, Transform DJs, will be known to the majority of Cross Rhythms' radio listeners. Their weekly radio programme, Movement Radio, is a fascinating glimpse into the burgeoning world of Christian EDM while their hypnotic tracks like "Valley" and "Forever" have been getting heavy Cross Rhythms radio play and that play will only increase now that their propulsive "Wildfire!" has made it on to the Cross Rhythms' playlists. So who exactly are Transform and how have they developed to become a spearhead ministry in taking the rhythms of clubland into churches, festivals and car stereos? The line-up of Transform, who last month abandoned the DJs part of their moniker, are DJs and record producers Jonathan Burgess and Tim Heil, along with their wives, Angela Burgess and Lorna Heil. Their story began in a red brick warehouse in Denver, Colorado when DJs Jonathan and Tim, heavily influenced by Britain's Christian dance music pioneers like The World Wide Message Tribe and dBA, and America's Scott Blackwell, decided to put on an event very, very different from the drugs-and-hedonism of much club culture. Said Jonathan, "We started throwing these monthly events to reach the rave and the club culture at the time. We saw all kinds of unchurched people - party kids, we would call them - come to know Jesus. It was so exciting. We had a warehouse in downtown Denver where drug dealers would come, kids on drugs would, and we would just pack this thing out. People in the music industry - the local club scene - were really excited about what we were doing because it was so positive. The vision of that whole season was, 'Let's throw a big warehouse party - different from a club night because it was all night long and reminded everyone of the rave scene.' Then we threw a VIP party a week or two weeks later. We were able to invest in a fourth of the people who had been at the rave. That model was hopefully to get them into a Bible study - from a club to a Bible study. We were able to share the Gospel with all kinds of people from the industry, see party kids saved, buy a Bible for a drug dealer. It was really exciting." Tim took up the story: "We started incorporating live elements with our DJ set - drums, vocalists. We hope to incorporate even more things, whether that's keyboard, synths, other live instrumentation. But I think once we started introducing singers, drums, that's when it became more of an act or a band. We had the tracks already built, then we worked around it and said, 'How can we incorporate these elements?' So now we're thinking ahead. How can we integrate more of those things and create a show on top of the music we're creating outside of the show." After a while Transform DJs began making their computer creations available to other EDM enthusiasts, and this in turn led to the release in 2015 of a full on 17-track album. 'Never Alone', with its club-savvy mix of pop techno, dubstep and house, was warmly accepted by all who heard it, Cross Rhythms picking up on the tracks "Valley", "Forever", "So Good" and "Can't Take It", all being selected for the CR playlist. Cross Rhythms was not alone in its support. Top DJ and producer Andy Hunter enthused, "Great job on the album guys. Love it!" while David Thulin, the DJ, producer and presenter of The Reconstruction Radio Show, commented, "Transform DJs have figured out how to worship Jesus while clubbing hard to EDM bangers. I'm loving every second of it!" In addition to their live performances and producing a steady flow of new recordings, Transform have, since July 2017, begun recording a weekly radio show, Movement Radio, which is being syndicated to various radio stations including Cross Rhythms. Fitting in all these things is a challenge. Explained Jon, "We have to do the radio show weekly, then we try to add on finishing songs, whenever we can, still in that studio day. The touring ebbs and flows. 2015, 2016 were really busy - busy for us - '17 we had some cool shows but less busy. We haven't been on multi-week tours since we started the radio show. At that point we just start running re-runs." Making a living out of all this EDM activity is not easy. Said Jon, "My wife and I operate as musicianaries. We've been in youth ministry for a long time. Tim and Lorna are heavily involved in their church. It's not full-time like TobyMac or Casting Crowns is full-time. My wife and I are devoting our time to this as our main project, mostly as musicianaries." Tim added, "I've had different means of getting an income outside of Transform - a job or other things. In those other times we have free, that's when we're working on music or ideas, brainstorming for the future, putting together a radio show for the week." Dance music ministry has had to withstand considerable criticism down the years from conservative elements within the Church. Although the once widely held conviction that moving a body to heavily rhythmic music was in some way unchristian is now thankfully subsiding, there are still some within the Church uneasy about the use of instrumental dance music. I asked Jon whether when it comes to an instrumental track, does it make a difference that the artist is Christian? "That's a good question. If it's an instrumental track off a movie soundtrack, or a dance song, sure. You're not paying that much attention, maybe your life isn't that affected. But I do believe that the Holy Spirit can use anything. We don't put too much focus on the enemy, but we do know that he tries to use things as well. Behind even an instrumental track there can be a spirit or an ideal or a heart. People who listen aren't thinking about this, but we know how and where that was made, what was happening in the atmosphere around us. If that's happening prayerfully, or if a Bible verse is being attributed to that track, or we prayed over the music, then I believe God can use that to set people free. We're pretty vocal from the front of the stage; but even if we weren't, on that day, I believe some of that instrumental music has the power to set people free, or at least feel the presence of God, which maybe they can't explain or understand. That's all a part of it. Conversely, I believe some songs you just feel weird about - it's made under the influence of drugs, or maybe the artist has a tendency to promote themes you know aren't Godly. It's also knowing the whole. How's this curated? Who's the source? And you can trust the person behind it because you know other things about the person." 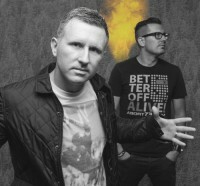 A big Cross Rhythms radio hit recently has been the team's "Valley". Tim undertook the difficult task of describing this decidedly off-kilter cut. "It's instrumental but there is a spoken vocal on it, taken from Psalm 23. Hopefully that's why people are getting a response out of it. I would say it's electro-house, maybe electro-pop. There are so many genres and subgenres in dance culture. Every few years we have to re-educate ourselves as to what's out there. It used to be you had house, maybe progressive or trance, drum and bass; that's about it. Now it's broken up into genres and subgenres. Some of the key places you buy music from - say a website called Beatport - they've had to clean-up their genres, make sure the music was classified appropriately. It tied to our ADD culture, or maybe our desire to be unique. We can't just put it under this generic label, we have to say, 'It's a combination of this and this. It's this genre meets this genre, but produces this new genre. Here we go!' It's a never ending learning process for everybody." Another Transform track getting Cross Rhythms exposure is "Forever". It was written by Lorna Heil. She said, "The melody was a bit different. In the recording studio it was really hard because I kept singing the original melody. It's about meeting Jesus. People see this light. God is love. They catch a glimpse of his love or his light and they're like, 'I need more of this.' God speaks eternity in their life. When they come in contact with Jesus Christ, this is forever: it's not about this moment here on earth, it's so much bigger than that. It's about eternity and relationship." Another track on 'Never Alone' soon to get heavy Cross Rhythms play is "Can't Take It". Jon Burgess spoke about that song's theme: "We know that God is coming back. Tim said something about a verse in Revelation early in the vocal booth. How to deal with Jesus coming back, and we just can't take it until he comes back. Yes, we have work to do - because that's our primary heart, evangelism - but we just can't take it: we want our Abba, the one we have relationship with. We want him to come back, and we can't do it without him. The breakdown where it says, 'I run so fast' - that's a vision I had, an intimate moment with Jesus. I had this vision of him sitting in the throne room, and a lowly person you would imagine having to walk all the way to the throne, and the king may or may not pay attention. But in this case, because it was Jesus, as soon as the door was opened he left his throne and ran as fast as he could to the door. The person in the vision was me. He wrapped his arms around me and just slid, even ripped part of his clothes on his knees. So just a picture - I run so fast towards you because I want that relationship with you. And it's a response: I run so fast back to you. It's more of a love relationship, a picture of a king and a serf having relationship, because that's a picture of what Jesus did coming to earth." Many of Transform's supporters are suggesting that their brand new "Wildfire" is their best ever. Said Tim, "This is a song we've been working on quite a while. Originally it was an instrumental track that Taylor had created. He said, 'Hey, what do you guys think of this?' We played it at a show and people really dug it from an instrumentation stand point. They were like, 'Wow! That's amazing - a slammer of a track!' Putting it together, finalising the edit, we said, 'You know what? I think we can put some lyrics to this.' I have a pastor at my church that uses this phrase, 'A little bit of wildfire is better than no fire.' The purpose of that statement was that we can explain when the Holy Spirit does something that might seem weird to people, because it's either in the Bible or it's not. We can back it up. But what we cannot explain is a powerless Church. So he'd say, 'A little bit of wildfire is better than no fire,' encouraging the church to step out and be passionate for Jesus. We said, 'Why don't we write a song that's around that concept of wildfire'. We wrote some lyrics that talk about the Holy Spirit moving, but also an evangelism, rally call. One of the lines is, 'We're taking names, we'll spread it out like wildfire,' basically, 'Come join the movement. It's going to be lit, and it's going to be spread like wildfire. We're going to take the world to Jesus.' So those lyrics on top of a pretty edgy, slamming kind of Melbourne electro-house track."